Our OTR Sidewall Protector is the result of more than a year of testing and many revisions to get the perfect product. Having been extensively tested in extremely harsh conditions, we know that the OTR Sidewall Protector will dramatically reduce the chances of tire sidewall punctures. The OTR Sidewall Protector is available now for tire size 29.5R25, with more sizes coming soon. For more information about the OTR Sidewall Protector, see the article in this month’s issue of Rock Products. 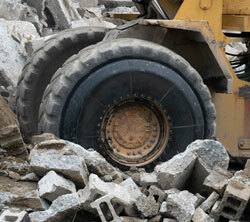 Repairing a damaged sidewall takes valuable time to send a tire out for repair and the repair might not be successful. A mining operator faces a sidelined heavy equipment truck and an expensive tire replacement.